Cost to install a kitchen faucet varies greatly by region (and even by zip code). Get free estimates from plumbers in your city. Cost to install a kitchen faucet varies greatly by region (and even by zip code). The average cost of installing a kitchen faucet is around $350. 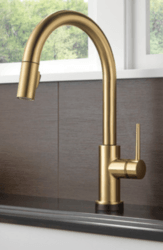 How much does it cost to install a kitchen faucet? 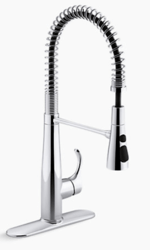 Kitchen faucets are integral to the function and use of the room. The faucet provides water for washing dishes, fills pots, supplies drinking water, waters plants, and can be used to bathe small children and pets. Every kitchen sink has a faucet installed alongside it to complete its purpose. The average homeowner in the U.S. spends around $350 for a monobloc, pull-down kitchen faucet, including installation. * We selected faucets from different brands to improve and clarify the information contained in this table. We do not receive any monetary compensation from these companies. 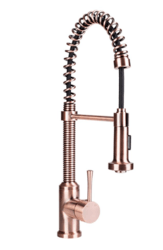 Kitchen faucets come in three different neck or spout styles. The standard neck comes up a short way from the base then extends upward in a straight angle. It may or may not have a pull-out spray head. The gooseneck is popular for homeowners who use a lot of tall pots. You can fit more things beneath the neck, and its reach, or swivel, is often greater. It may also have a pull-down head. The bridge is more stylish in traditional or farmhouse designs. It consists of two pipes extending either up from the deck or out from the wall that meet in the center at the spout. 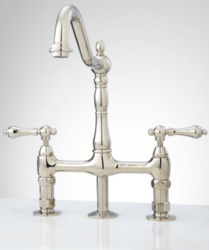 Bridge faucets may have differently shaped necks but often have what is known as a Victorian neck that curves in two to three places. Your kitchen faucet may be operated by one or two levers or handles. They may be mounted next to the spout or on the bloc that the spout is mounted on. These come in a variety of styles, including true levers, spokes, or discs. This is primarily a personal choice, but many people with arthritis or trouble using their hands may find the lever style easier to use. Your faucet may also have a touchless operation that turns the water on from a button concealed in the toe kick of the sink cabinet. In general terms, there are two locations for a kitchen faucet. A deck-mounted faucet is installed in your countertop or sink. It may be located in the center or to one side. D-shaped sink bowls work best with the faucet on a corner while larger sinks may need it in the middle. Wall-mounted faucets are installed in the wall directly behind your sink. They extend out from the wall and into the sink itself. 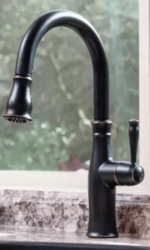 Some have a jointed spout to allow farther reach into a larger sink, while others have a fixed and straight spout. Faucet sizes vary widely depending on the model. 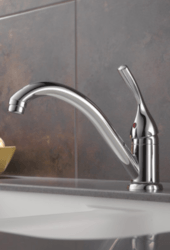 If you choose a monobloc faucet, this is a single-hole style with a faucet that extends between 12 and 18 inches into the sink and reaches 12 to 18-inches high. A widespread faucet has handles located exactly 8-inches apart on center with the spout between. It also extends 12 to 18 inches into the sink and in height. 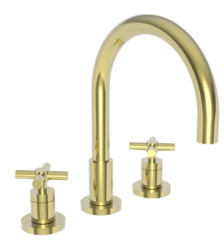 Some faucets have specialty drillings, such as a faucet with one handle that sits separately. If you are replacing a faucet, you need to match the drillings or opt for a plate that will cover the existing drillings in the counter. Otherwise, you can have the new counter drilled to fit the faucet you choose. Installing a kitchen faucet is a fairly straightforward and easy process that many homeowners choose to DIY. If this is a replacement, the first step in installation is removing any existing faucets. That involves shutting off the water and loosening the nuts holding the faucet in place before disconnecting the supply lines. Then, the nuts are removed from below, and the old faucet pulled out from above. The new faucet installs in the reverse order. The new pieces are put in from the top and tightened beneath the counter. The supply lines are connected, and everything is tightened down before the water is reconnected and tested. The entire process takes about an hour from start to finish, assuming all the pieces are in good shape. It takes a plumber about one hour to install a faucet, two hours when also hooking up the sink and drain at the same time. Plumbers charge around $45 to $65 per hour, and most faucet installations cost about $50 on average. 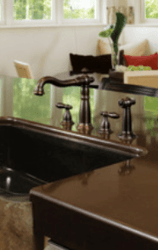 The maintenance for your kitchen faucet varies depending on its finish. Chrome, plastic, and stainless steel can generally be cleaned with anything. Other finishes require PH-neutral or special cleaners designed for that metal. 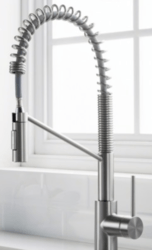 If your faucet has a PVD (physical vapor deposition) finish, this makes it easier to keep clean and eliminates hard-water buildup and corrosion. However, this means that you must avoid using bleach on your faucet. Always ask the manufacturer of your faucet for cleaning information. It is common to have an in-counter soap dispenser installed with your faucet. These cost between $25 and $50 and simply screw right into place. 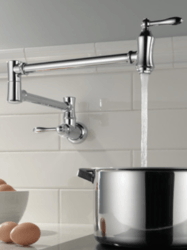 Some higher-end faucets allow you to adjust the angle of the spout or how the water emerges into the sink. This is less common, but for large sinks or busy kitchens, it may be helpful. Expect to pay at least $300 for faucets with this feature. If you have poor-quality drinking water, you may opt for a built-in water filter. These install beneath the counter and filter your water right at the sink. They start at around $100. In most cases, the cost of removing an old faucet is factored into the price of the installation. However, if the old faucet is corroded or needs a lot of work to get it free, this can increase costs by as much as $50. Most homeowners find that they replace their kitchen faucets every 7 to 10 years. Not all faucets will fit your current sink and countertop. In some cases, you may need to have a new hole drilled in a counter, while in others you may need to cover the holes with a plate. Always check the configuration before ordering, and speak to your plumber to make sure it will work. If your plumbing is not up to building codes or has leaks or other issues, you may need to repair it prior to having a new faucet installed. If your new faucet does not coordinate with your water supply, you will need to either purchase a different model or have the supply adjusted. If you wish to have an eco-friendly faucet, there are water-saving models available, which use fewer gallons per minute. If you have a larger faucet, you may want to choose a faucet that swivels to reach more areas. Most deck-mounted faucets that are either monobloc or widespread swivel while bridge and wall-mounted faucets are more often fixed. 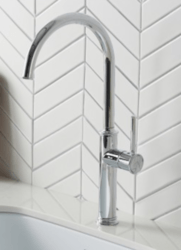 Most modern faucets that have a pull-down spout include a button for adjustable spray. This is no additional charge and can make cleaning in the sink easier. How much does a plumber charge to install a kitchen faucet? Plumbers charge around $50 to install a kitchen faucet. 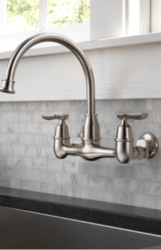 What is the cost to replace a kitchen faucet? 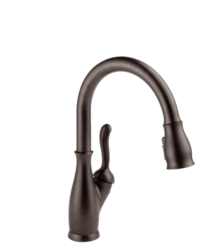 The average cost to replace a kitchen faucet is around $350 installed. 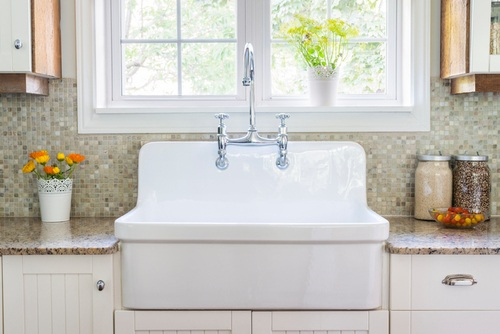 How much does it cost to install a kitchen sink and faucet? 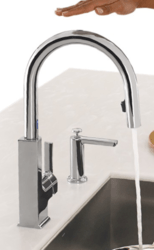 How much does it cost to install a kitchen faucet in my city? Cost to install a kitchen faucet varies greatly by region (and even by zip code). To get free estimates from local contractors, please indicate yours.